Using advanced LEDs producing up to 51,800 lumens, the D-Series, Size 2 embodies the definition of power and performance. The D-Series combines the latest in LED technology with a high-performance, high efficacy, long-life luminaire. The outstanding photometric performance results in sites with excellent uniformity, greater pole spacing and lower power density. 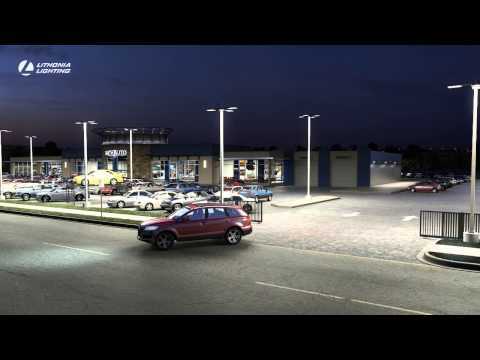 The sleek design reflecting the embedded high-performance LED technology makes the D-Series, Size 2 the ideal choice for car dealerships and large parking lots adjacent to malls, transit stations, grocery stores, home centers, and other big-box retailers.